NETWORK FINALS: CBS’s COLLEGE FOOTBALL game gained 0.2 after adjustment to 3.1, while ABC’s stayed at 1.4, and NBC’s BREEDERS CUP coverage remained at 0.3. CABLE HIGHLIGHTS: A quartet of ESPN COLLEGE FOOTBALL games took 4 of the day’s Top 8 slots, led by the afternoon Maryland vs. Michigan game at 0.73, with the earlier Vanderbilt vs. Auburn game right behind it at 0.72. Hallmark continues to thrive with its holiday movies, this week’s being THE MISTLETOE PROMISE at 0.67, while Lifetime’s movie WHO KILLED JONBENET? was at 0.43, with an AFTER-SHOW documentary at 0.36. After a week off for a marathon of reruns, Adult Swim added CHILDREN WHO CHASE LOST VOICES to its late-night animation line-up at 0.25 in the 3AM slot; it was preceded by DRAGON BALL Z at 0.62/1.293M, JOJO’S BIZARRE ADVENTURES at 0.48, MOBILE SUIT GUNDAM at 0.41, HUNTER X HUNTER at 0.40/860K, NARUTO at 0.36/769K, and ONE PIECE at 0.32/674K. Fox Sports 1’s UFC FIGHT NIGHT was at 0.39. On Spike, COPS rose 0.04 to 0.33, and JAIL: BIG TEXAS ticked up to 0.21. On Food Network, PIONEER WOMAN slipped 0.02 to 0.24, KITCHEN AT FN was steady at 0.22, AYESHA’S HOMEMADE was at 0.20, and VALERIE’S HOME COOKING stayed at 0.17. 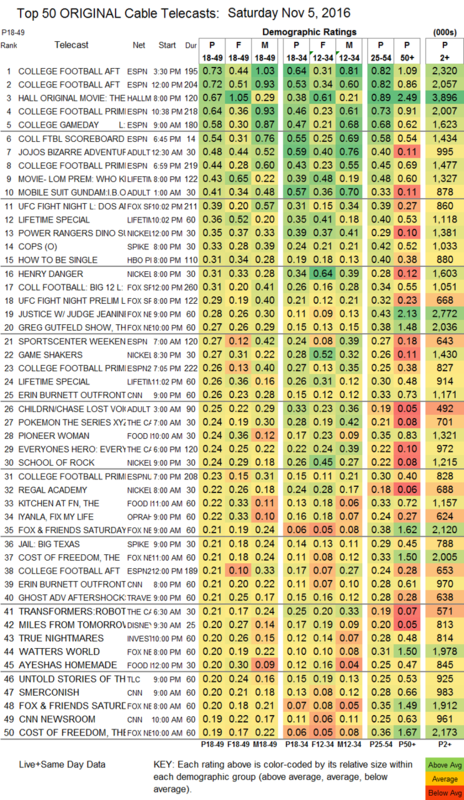 TLC’s UNTOLD STORIES OF THE ER was at 0.20. BBCAmerica’s DIRK GENTLY’S HOLISTIC DETECTIVE AGENCY ticked down to 0.09.